2.1 How to Get to Langkawi From Kuala Lumpur? 2.3 Is Langkawi a Party Island? 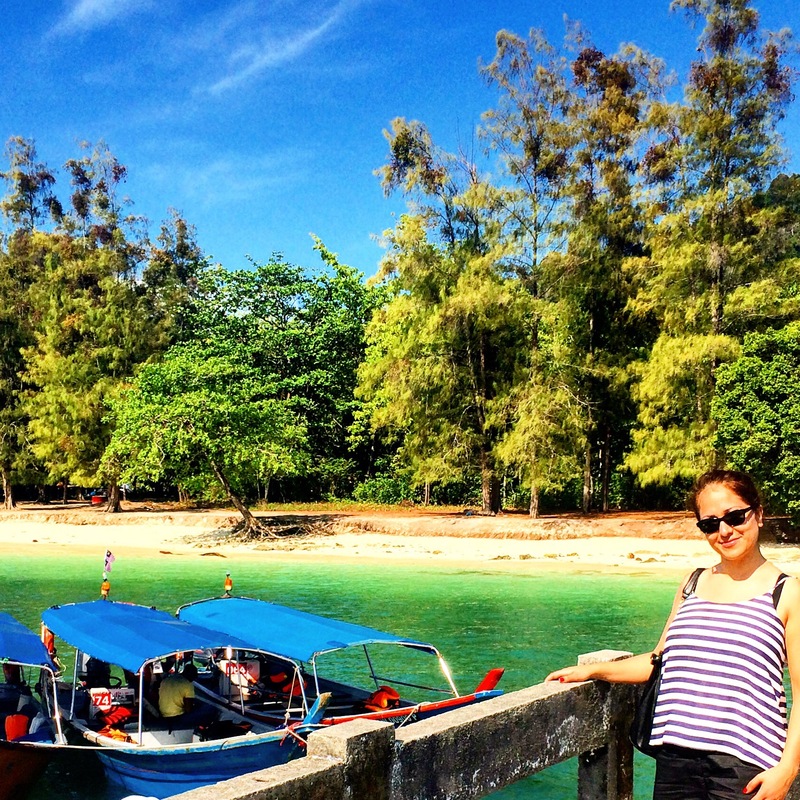 2.6 Where to Shop in Langkawi or Better: Is Langkawi Really a Shopping Paradise? 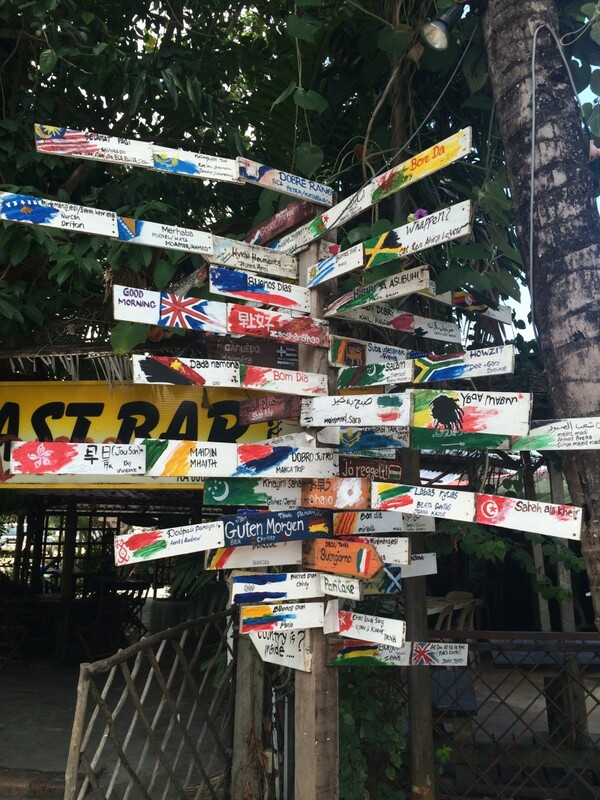 2.7 Where to Eat and Drink in Langkawi? 2.9 How Long to Stay in Langkawi? Langkawi, an archipelago made up of 99 islands, is probably one of the most beautiful islands, or better one of the most beautiful archipelagos, I have been to. Is Langkawi worth to visit? I say: Yesssss, it is. 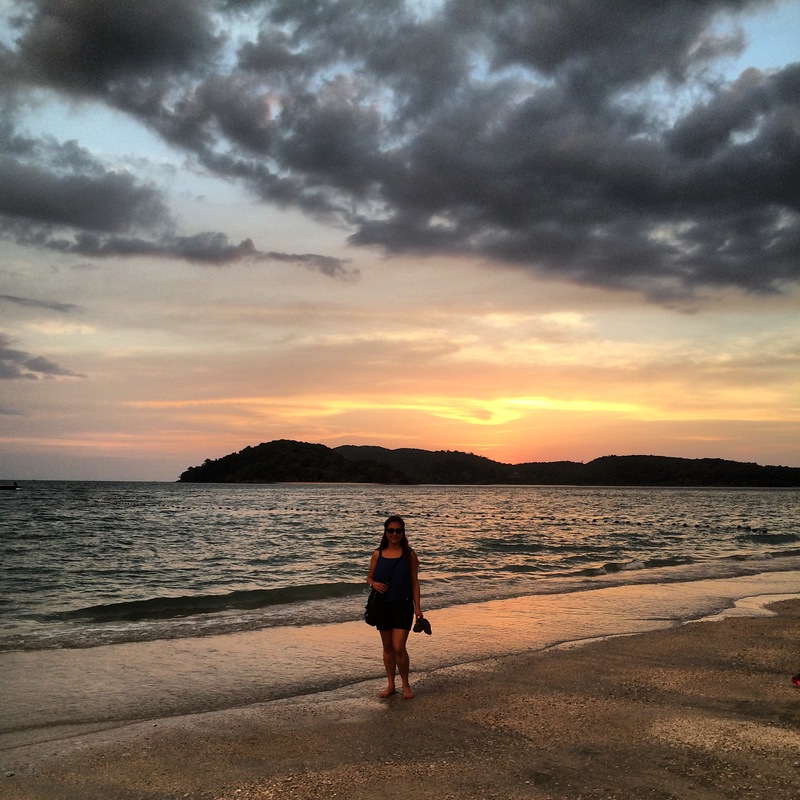 What to do in Langkawi? 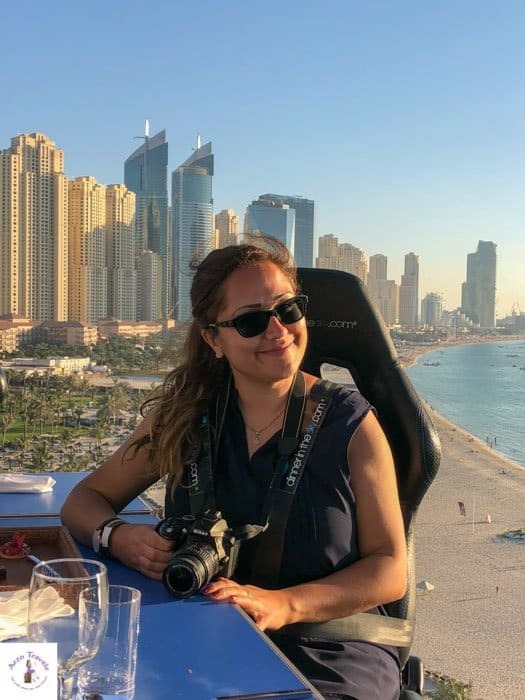 I had known about the beautiful beaches in Malaysia but when I visited Kuala Lumpur (more about Kuala Lumpur) for the first time, I was not sure which Malaysian island to visit. I was not sure about the best places to see in Langkawi, but I opted out for Langkawi based on recommendations of my cousin but hadn’t done any real research beforehand. I must say that I was overwhelmed by its beauty. 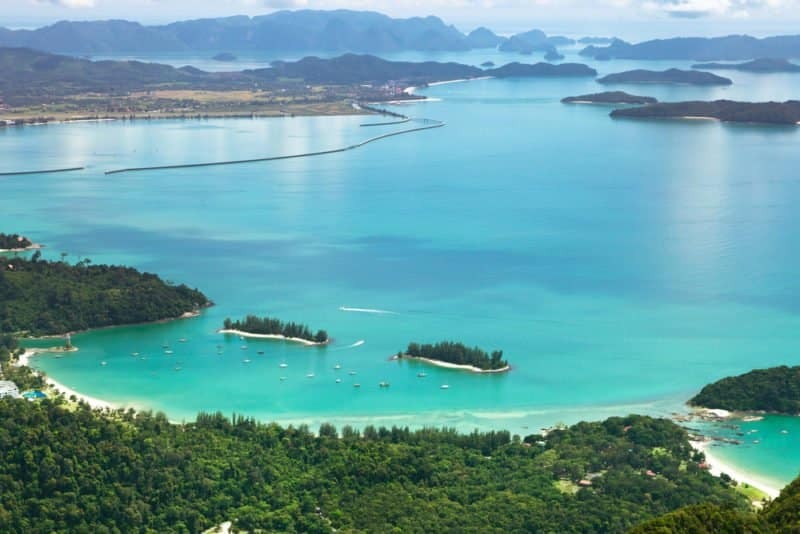 Langkawi is NOT a party island, not totally overcrowded and has a lot of small, tiny, stunning islands – Langkawi is a bit like Thailand´s islands, but less crowded and still kind of untouched. So, not surprisingly I fell in love with the little paradise in Malaysia. 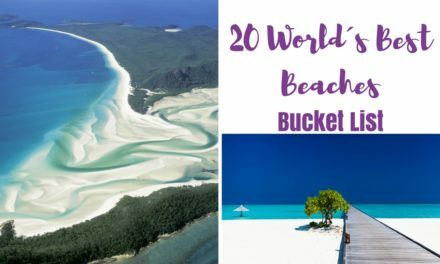 Though I am 100% sure that Malaysia has more stunning beaches I think, Langkawi should be on your Malaysia itinerary and it is for sure a bucket list destination. Before talking about the best things to do in Langkawi, here is a quick Langkawi pre-travel guide. How to Get to Langkawi From Kuala Lumpur? Flying to Langkawi might be the easiest way to get there. Cheap airlines will fly you to the island north/west of Kuala Lumpur on a daily basis. 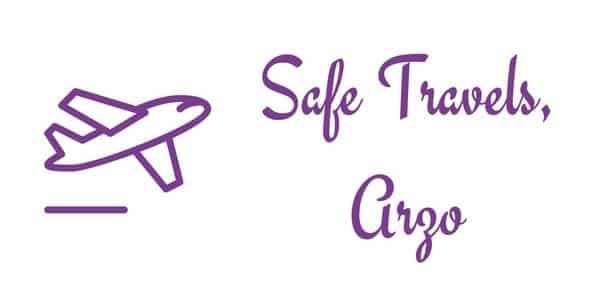 If you don´t book all the extras (which often come with cheap airlines) the flight can be a real bargain. Another way to get to Langkawi is by sea from several cities. Another way to get to Langkawi from Kuala Lumpur is to take the bus to one of the cities that have a ferry connection (like Penang). One negative aspect, that really bothered me, was the lack of public transport. There isn’t any public transport, like buses or trains, at all. If you want to see a little bit more of the island you need to rent a car, a moped, bike or take a taxi and, of course, do some island hopping by boat. Like in Kuala Lumpur some taxi drivers try to overcharge you. It is a constant battle between the driver and the customer because some, or better say most, drivers try to rip you off. Apparently, there are fixed prices for certain distances, but most taxi drivers try to put another price on fares. This was actually really annoying. Is Langkawi a Party Island? In Langkawi, alcohol is, like in all of Malaysia, comparatively expensive. This has the positive side effect that there are not many drunk tourists. Actually, you will not see many young people just coming for partying at all. It is more a place for people who like it a bit calmer. Most people I saw there were families or tourist like me – well, I mean a bit older :-). Once again, I was positively surprised to see how cute natives are with younger tourists and I think Langkawi is great for kids. I also reckon that Langkawi is a beautiful honeymoon destination and quite romantic. However, though Malaysians are mostly Muslims there isn’t a strict dress code in Langkawi. I saw a lot of girls in bikinis (apart from the beach), as well as fully covered girls (I assume they were tourists from the Gulf Region). Though I never saw natives expressing their disapproval, I still recommend keeping in mind that it is an Islamic state and bikinis and extreme short hot pants offside the beach are not really appropriate. Langkawi in Malaysia. A quick guide. As mentioned above I did not do a lot of research and just booked a room 1-2 days prior to my arrival. I made the mistake to book a room in “Kuah” because I heard that it is the town center and I thought, that the town center might be a good idea. It turned out that the town center was not really interesting and pretty far from the beach. Though I booked that room for 4 nights and paid in advance I decided to leave the hotel and look for another after the second night. I chose a room closer to the beach (Patai Cenang Beach, more about the beach in the “Best beaches in Langkawi section below). Langkawi is a great budget destination (as many places in South East Asia) and food and accommodation can be quite cheap but Langkawi also has some luxury hotels if you want to spoil yourself. There are heaps of hotels and resorts at the beach. If you don’t book online but ask for availability at the reception they most likely will give you a discount. I found a little room at a “resort” – a room with a beautiful view (well, though it wasn’t dirty, you can’t expect it a higher standard for so little money) and it was totally worth the 25€ a night (for 2). Never feel ashamed to bargain in Langkawi and as long as your price expectations are not unreasonable and you are still polite no one will mind your bargaining. I actually assume that some bargaining is expected. However, if you visit during high season booking in advance is definitely recommended. Click here to get the best prices for your stay in Langkawi here. Where to Shop in Langkawi or Better: Is Langkawi Really a Shopping Paradise? Langkawi is praised as a shopping paradise because there isn’t any tax on products. However, I learned very quickly that there aren’t many high-quality products and it is more households products that are offered. Also, the prices for beverages and food weren’t much better than in Kuala Lumpur, so it wasn’t my shopping personal paradise. Where to Eat and Drink in Langkawi? I love street food as much as I love a fancy dinner in a nice restaurant (especially at the beach). Since I stayed mostly at the Patai Cenang beach, I ate there most of the time. It is the busiest part of Langkawi with a lot of restaurants, cafes, street food, shops, and beauty salons. 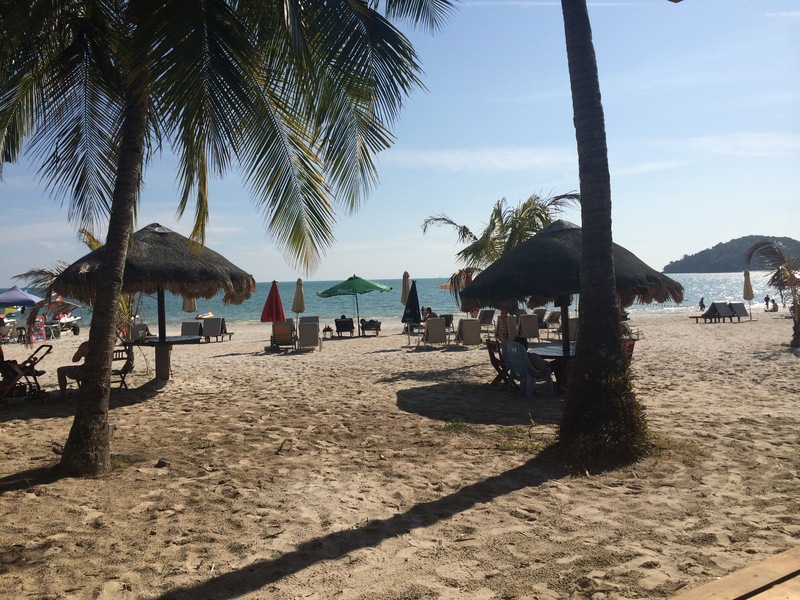 Langkawi has great food options and I often went for Chinese or Asian food (I even had Arabian food once) and what is better than to dine at the beach?. There is also European food in Langkawi if you prefer pasta or pizza. As mentioned above there is food for every budget, whether you prefer to have fancy food in one of the 5* resorts or budget and yet delicious street food. There is, of course, a lot of seafood and especially in the Chinese kitchen is a lot of meat (since Malaysia is Islamic it was mostly chicken, but also beef or lamb) and it happened several times I had meat in my food though I ordered vegetarian. Finding vegetarian food is not difficult though since it is often freshly cooked so you can just order vegetarian options. I am a fresh juice addict, so Langkawi is a paradise for me with all the fresh juices which you can order at every corner. The prices, however, are not as cheap as I had seen it in other East Asian places like Bali. How Long to Stay in Langkawi? It always depends on what you are looking for. It is a great island for relaxation and fun things to do. 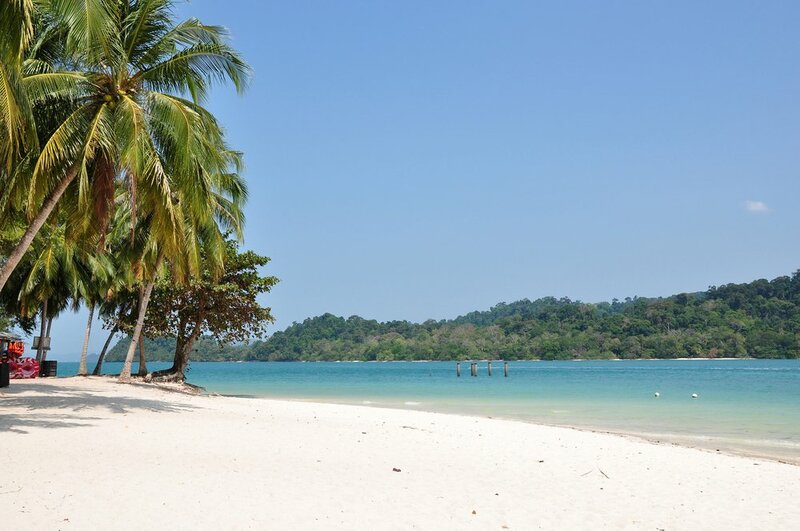 The Langkawi beach, or better the beaches in Langkawi, are extremely beautiful and if you do some island hopping you can experience several islands and beaches in Langkawi. I personally thought, 5 days in Langkawi were optimal because I needed a big city after a few days in paradise. But if you enjoy the beach and the quietness you will surely enjoy staying longer. Other than that it is a lovely island with friendly people and a beautiful scenery. I hope I will get the chance to visit the so-called Jewel of Kudah again. 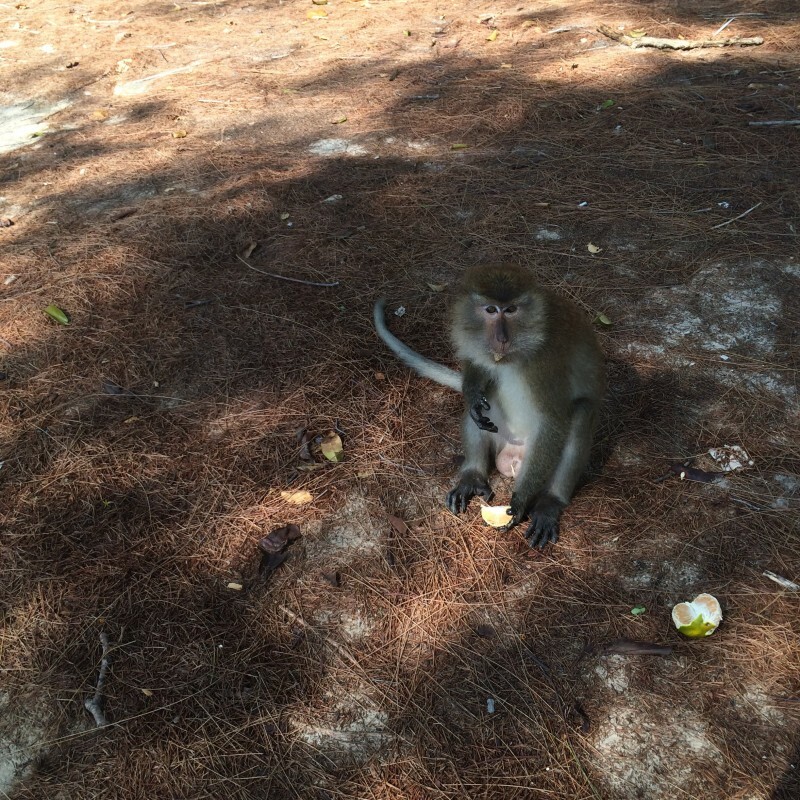 hough Langkawi is an island and thus activities a bit limited, there is still plenty to do and see. The most obvious thing to do in Langkawi is to enjoy those stunning beaches (more about that later) but there is more to things to do in Langkawi. 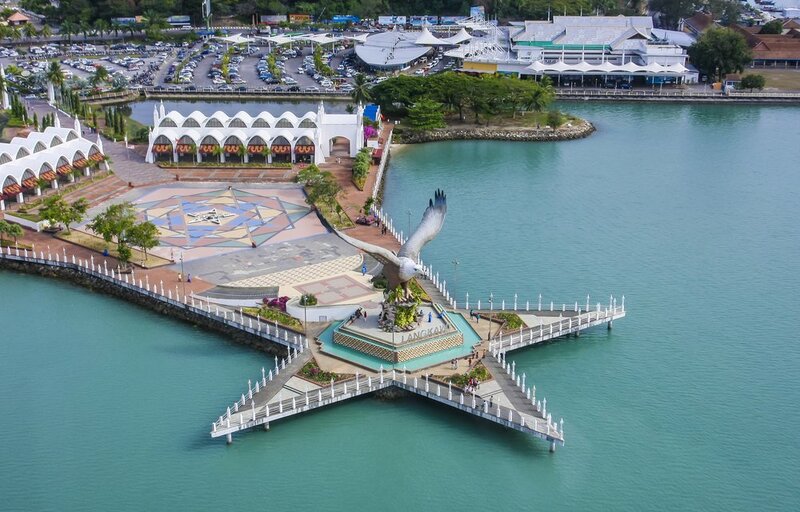 One of the places to visit in Langkawi is the Eagle Square .The eagle is the symbol of Langkawi Island, Kedah, so the eagle at the Eagle Square is a giant. Another thing to do in Langkawi is to pay a visit to the skywalk and cable car – a must for any Langkawi itinerary. is definitely the skywalk and the cable car in Langkawi. The view from up there is amazing – I took a cable car up, but you could also hike up. Up there you should enjoy the magnificent view over Langkawi and clear water, there is also a little bar where you can have a coffee and get some Langkawi souvenirs. For walking the skywalk you need to wear solid shoes otherwise, you need to rent some shoes because you will not be allowed to enter. One of my favorite activities in Langkawi was the island hopping. It surprises me, every time again, to see that the system of booking tours via hotels, or tourist stands, works perfectly in countries like these. You get picked up at the time you are supposed to. I have never made any bad experiences with that really old system of booking a tour. This makes me always wonder why Germany needs such a complicated way of booking and still it doesn’t guarantee any satisfaction. However, check out some companies and prices before deciding, but those tours turned out to be the most fun and I got the see many beautiful spots. The island booking tour I did took almost all day. 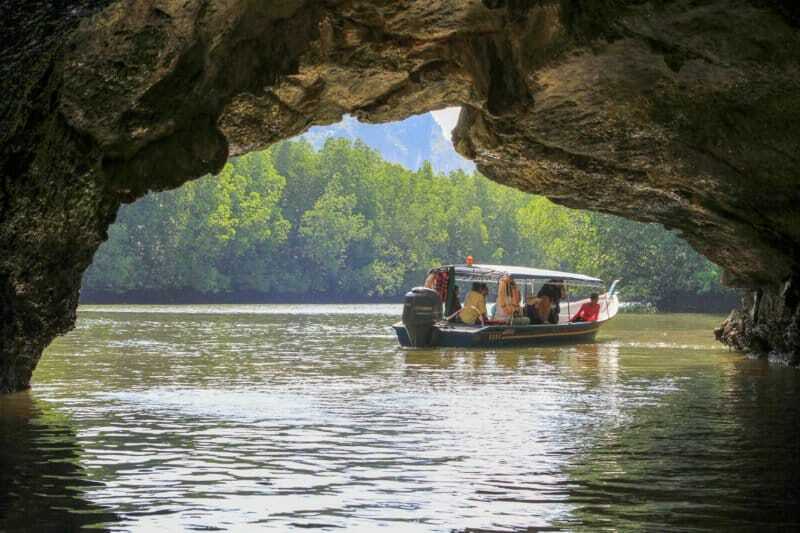 We were picked up from the hotel and then we started a boat trip with several stops for swimming, watching eagles, and enjoying the beautiful nature of Langkawi. 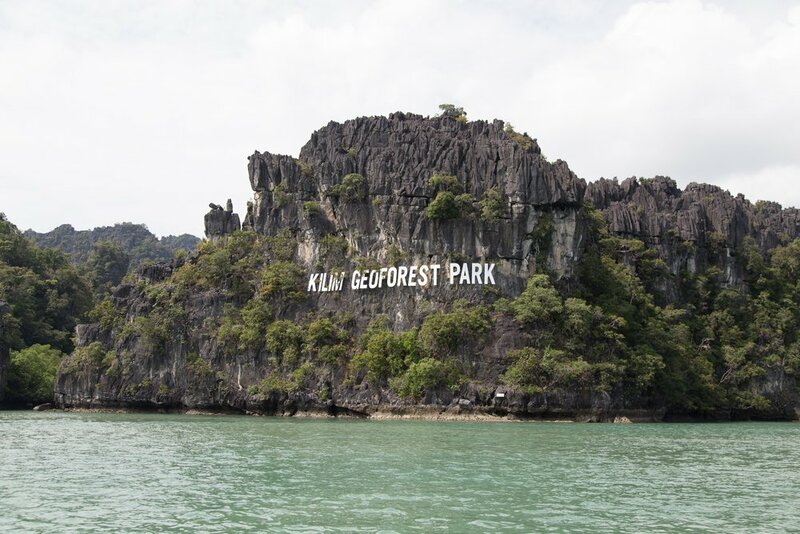 We also stopped at the Kilim Karst Geoforest Park which was interesting to see and one of the highlights of the island hopping. 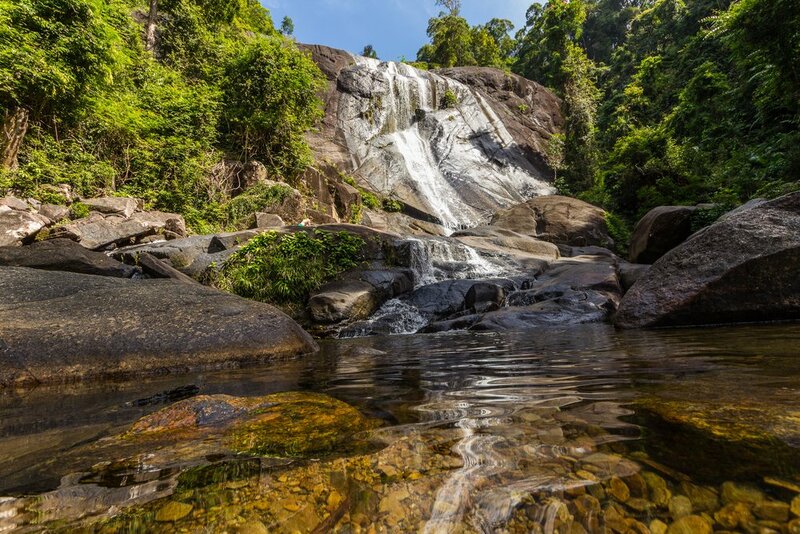 Another beautiful place in Langkawi is the 7 Wells Waterfall (Telah Tujah Waterfall) which is close to the cable car station in Langkawi and we were told it is a must-see place – which I am sure it is. However, when I went up all the stairs it was dry (to be fair we were also told that there is not a lot of water that day but we were still recommended to visit) and there were no waterfalls. Apparently, you can swim in the natural pools (which I did not really see) – though it was dry the hike was still good and if you are lucky you might be able to enjoy a wonderful time there. 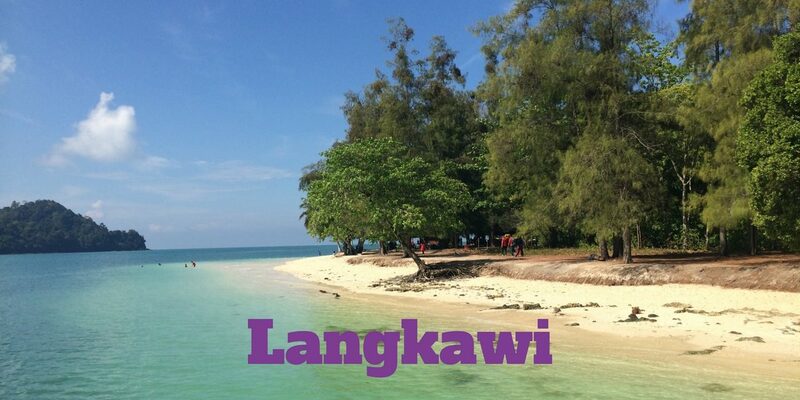 Which are the Best Beaches in Langkawi? 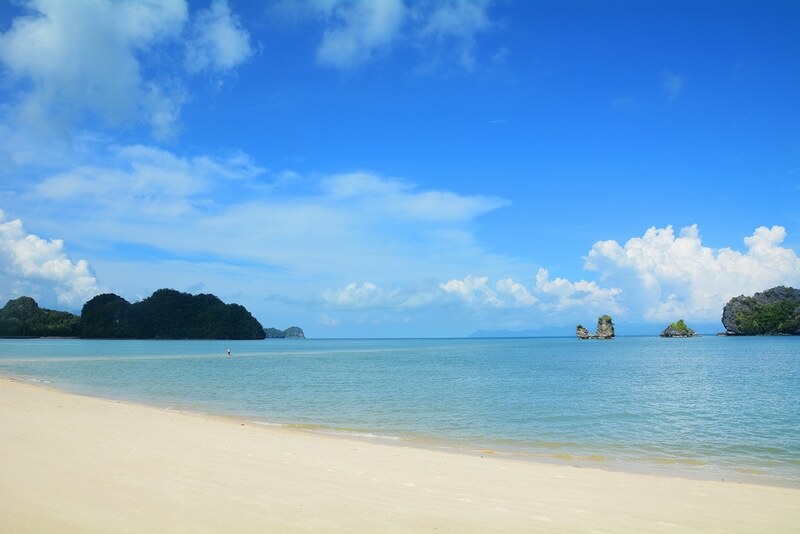 As mentioned prior another thing to do in Langkawi is to enjoy the amazing, white sandy beaches of Langkawi. Beras Basah Island was probably my favorite beach, but there are plenty of fantastic beaches there, here are some great beaches. My “resort” was at Patai Cenang – the busiest beach. Though it was busy it was not crowded and there are tons of activities to do: all kind of water sport, but also relaxing at this gorgeous beach is like spending time in paradise, and it is also a great place to watch sun sets. There are also tons of restaurants, cafes, shops etc. so there is more than just a beach. Pantai Tengah is the longest stretch of beach in Langkawi and another beauty. Tanjung Rhu in known as one of the most beautiful beaches and was another stop of my island hopping tour. Burau Bay is close to the cable car but I have not visited. The middle section of the beach is open to the public and is supposedly extremely beautiful. Langkawi also has a black sand beach which I did not get to visit (due to laziness), and I have heard mixed reviews. The sand is not that black as it used to be – say some. Is the black sand beach in Langkawi worth to visit? Yes, say the others. Since I have not visited I cannot give any advice, but to be honest, I am not too sad I did not make it there because Langkawi has just gorgeous beaches. 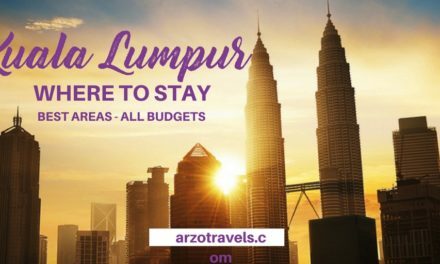 Looking for more destinations in Malaysia? Check out the travel guide to Penang. If you plan to visit Langkawi (congratulations on that great decision by the way) check out the best prices for flights I hotels I activities and tours in Langkawior hop over to the 10-day itinerary for Malaysia where you will also find more information on beautiful destinations like Melaka or Cameron Islands. 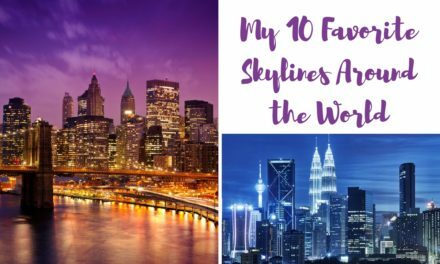 I am sure these posts will inspire you to visit Malaysia and give you some ideas about what to do and where to go. Disclaimer: This post contains affiliate links – this means I might earn a small commission when you buy a product via my links (at no extra cost to you). More about it here. 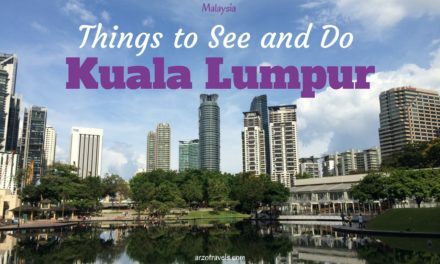 Check out my blog post on Kuala Lumpur for more information on Malaysia.